After a winter including many interesting excursions (the results of which will be trickling out through the season), we have our web volunteer back from hibernation just in time for paddling season! We think they may have run aground somewhere and gotten stuck, but it seems we’ve finally had enough water to refloat them, would you believe? Just a bit down from the park is Rackley Bridge. When the water’s low, you have to stand up in the canoe and reach far above your head to touch the bridge. The water… wasn’t low. In fact, it was so high that the top of the bridge was awash (and it’s only been getting deeper). We’re going to call it paddling across the top of the bridge even if you run aground (as long as you don’t have to get out), but the bayou was still on the way up, so we just got there a bit early. 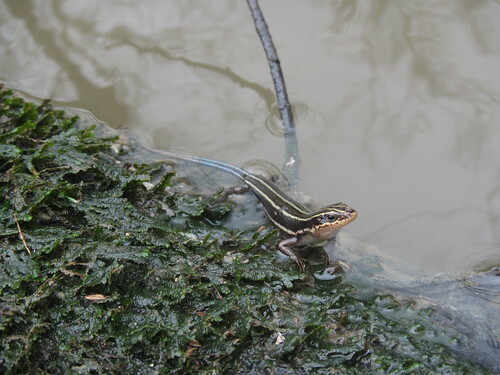 With the warm weather, there were plenty of reptiles and amphibians about. The cute ones are the colorful little guys who sit around on a floating log watching you work to clear a jam. He was so calm about it all, we figured he was waiting for the camera, so we happily obliged. 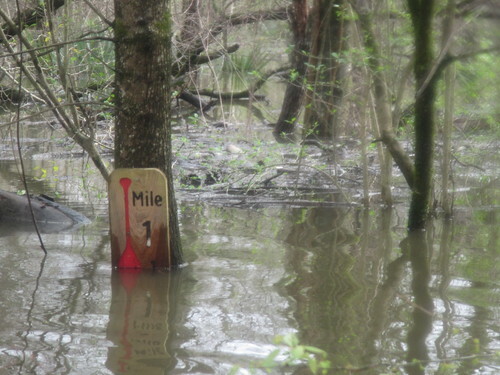 The mile 1-1/2 marker is apparently the lowest, as it was the only one semi-submerged at that point. The bayou doesn’t get this high very often, but we’ve seen a water line on the sign about this high at least once before. That was a sudden and brief high water event, however. This is higher and more prolonged. 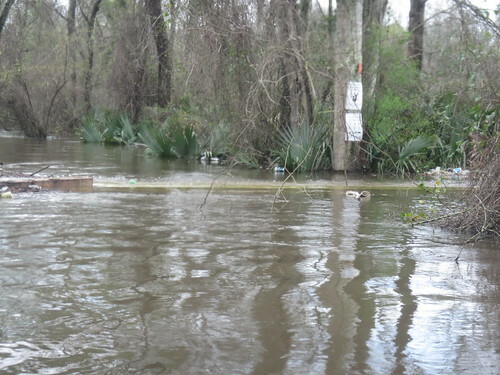 The point at the confluence of Bayou Fountain with Bayou Manchac is usually quite high above the water. Seeing it flooded was quite impressive. The giant water oak that had fallen last year looks like it may have rotated slightly upstream from the initial current reversal. It’ll be interesting to see once the water’s lower again. Now that the season’s starting (and we have our web volunteer back), we’ve loaded up a bunch of events on the calendar. 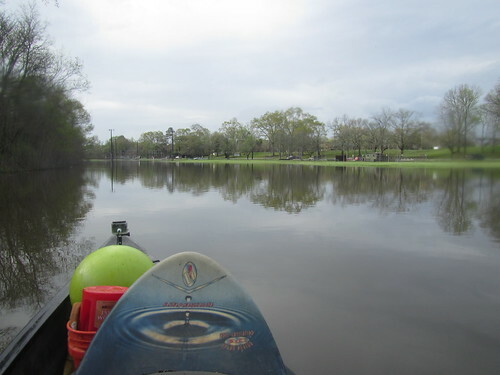 We’ve got a moonlight or night paddle scheduled each month. 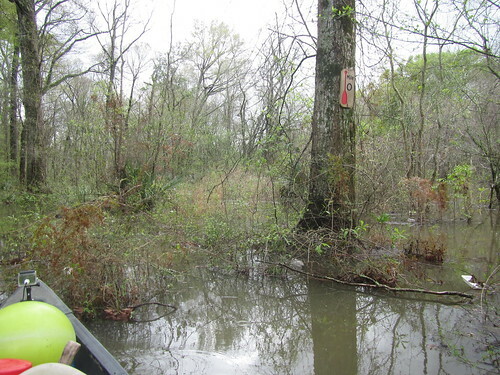 Our next cleanup should be in April (after one with Underwater Adventures was washed out due to the high water — it was supposed to be paddling, not scuba diving!). 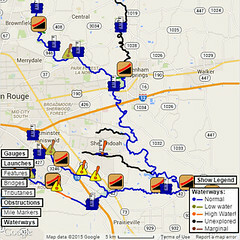 We’ve penciled in a day trip fun paddle or few and the next BREC Outdoor Adventure sunset paddle, too. Thanks for the video! It was so like being there and left a peaceful feeling.